The new Hyrule Warriors game has a slightly different crest embroidered into Link's scarf. This chart is for knitting, with a slightly elongated grid to accurately represent knit stitches. 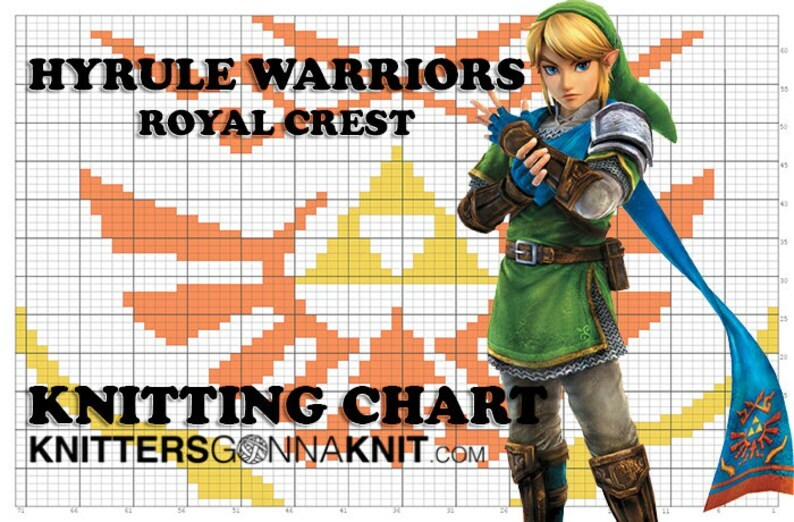 This listing is a CHART for the design and NOT a full pattern to make a knit project and NOT an actual finished item. The chart is a high quality 300 DPI image, making it ideal for viewing on the computer screen and even printed. It is gridded with numbers in increments of 5 and has bold lines every 5th stitch for easy reading. You will be provided with download link to the pattern file directly through Etsy immediately after you send your payment. Do not redistribute or resell this pattern. Due to the nature of patterns and other digital PDF items, they will not be accepted for return or refund. Love this pattern, and so will my grandson who's getting a blanket made with this symbol (his parents are big Legend of Zelda fans). Payment is appreciated the same day your order is placed. Orders may be canceled otherwise. Please contact me as soon as possible if something isn't quite right. I will accept returns of merchandise in its original condition and refund your money, less original shipping and return shipping at your expense. All items are made in a clean, smoke-free, and dog-friendly studio. Wool items are washed with tea tree oil and stored with lavender as natural moth repellents. Please keep this in mind if you have allergies to either of the scents. I do my best to accurately capture colors, and color correct photos if necessary. Please remember that monitor colors will vary. Knitters Gonna Knit reserves the right to refuse service to any individual and/or company for any reason. © Copyright 2011-2019 Knitters Gonna Knit; all rights reserved. Patterns, pictures, and designs are copyright protected. All images, ideas, and text in this shop are the property of Knitters Gonna Knit and cannot be reproduced or used without consent.